A complete package of 100s of business templates and documents which includes everything you’ll ever need to manage your staff and your business. A practical and cost effective solution to employment, health & safety, financial and business management. £24 for individual folders, and £49 for the complete 4 folder Employer Pack. We highly recommend this as a total solution to your business administration needs. If you are looking to improve your business skills, you need to gain an accredited certificate, or undertake training for you or your staff, consider High Speed Training. They offer a large range of ONLINE courses and there is no easier way to learn from £20. All the courses are e-learning based so can be completed at your own computer. This is the only e-learning provider that we recommend. We regularly update our policies, contracts and handbooks. If you download material, then to ensure you always receive notification of any changes it is very important that you subscribe to our free UPDATE service. How to dismiss staff when necessary..
How do you recruit the best staff? How can you make your workforce more flexible? 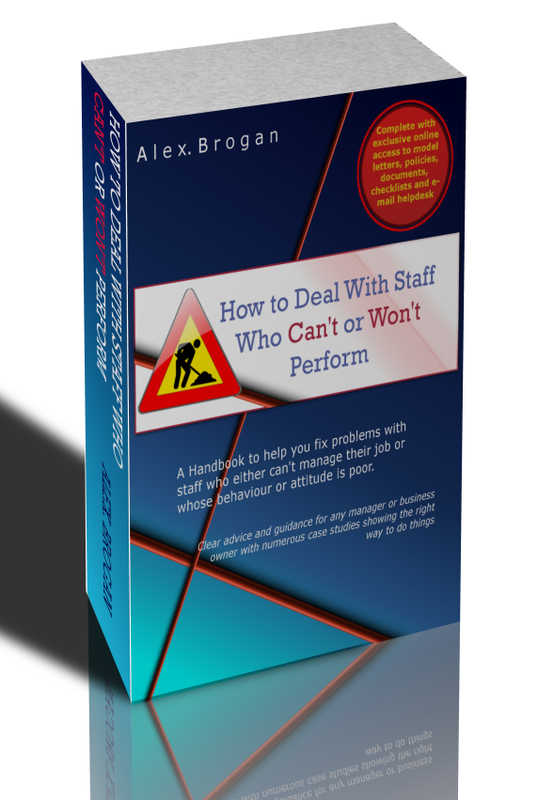 Our ebook on "How to Deal With Staff Who Can't or Won't Perform" by Alex Brogan is now available for download. Complete with an online resource pack and access to an email helpdesk,it outlines how to deal with everything from staff incompetence and sickness absence to cases of gross misconduct. There is a small charge for this (£4.99) which will support keeping our other resources free. So that you can be sure that any policy you download from Human Resource Solutions is up-to-date we maintain a Document Management System. This system is being rolled out from January 2018 as we review and update all our Policy Templates, Contracts and Handbooks. Also as we implement any new documents they will be added into and maintained through the Document Management System. Changes from previous version: Zero-hours section amended to reflect invidual's choice to accept offer of work or not. Data protection section strengthened to mention General Data Protection Regulation. Changes from previous version: Paragraph on lay-offs and short-time working added. Some minor amendments to wording. Changes from previous version: Amended to reflect invidual's choice to accept offer of work or not. Changes from previous version: No significant changes. Human Resource Solutions offers advice and these documents to UK organisations as a free service, and cannot be responsible or liable to any person or entity in respect of any cost, loss or damage caused, consequential or otherwise, directly or indirectly by the information contained in any advice, policies or procedures or their component parts, to include any mistakes therein on this website or blog.